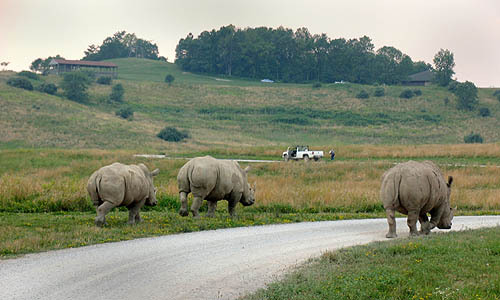 CUMBERLAND, Ohio -- Let's visit a home where white rhinos roam, and giraffes and the zebras play, where often is heard a banteng herd, and elands romp in the hay. No, it's not an African version of "Home on the Range," but an ode to a 15-square-mile swatch of savannah in southeast Ohio. The Wilds is a unique animal preserve 20 miles south of Interstate 70, roughly halfway between Wheeling, W.Va., and Columbus, Ohio. Opened to the public in 1994, the facility sprawls across more than 9,100 acres reclaimed from surface mining operations and donated by American Electric Power Co. to The International Center for the Preservation of Wild Animals. Described as part Noah's Ark for rare and endangered species, part scientific facility, part animal breeding farm, part ecological restoration center and part drive-through zoo and tourist attraction, the Wilds is now operated in association with the Columbus Zoo and is the largest project of its kind in North America, in terms of acreage and the number of animals. Roughly 20 percent of rolling valleys and grassy hillsides have been enclosed by electric fences and sectioned into large pastures, where 25 species of endangered land animals from Africa, Asia and North America all do what comes naturally, or as naturally as they're inclined in this predator-free environment. Among its residents, the Wilds is home to herds of oryx, both the scimitar-horned and the fringe-eared varieties. 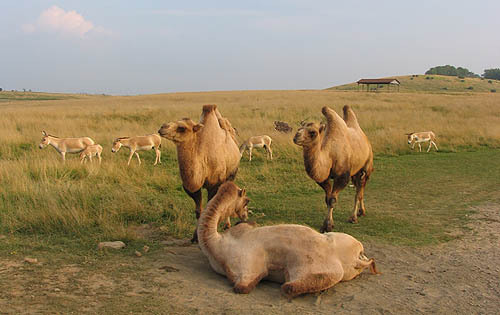 There are Persian onager, Chinese goral, Bactrian camel, Sichuan takin, Himalayan Tahr, Przewalski's wild horse and Pere David's deer -- more than 300 animals in all. Its extensive rhinoceros population includes Southern whites and greater one-horns. A new 60-acre, mid-sized predator center houses a pack of African wild dogs and half a dozen cheetahs in several enclosures. Yet few of these creatures are actually from the wilds. Virtually all were either born in zoos or on the grounds of the Wilds. The Wilds also includes a butterfly habitat, as well as birding station to view some of the more than 150 species that frequent the grounds, from native avians to trumpeter swans and red-crowned Manchurian cranes. One recent conservation program is reintroducing American Burying Beetles, an endangered species back in the grasslands. 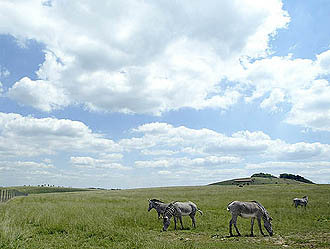 The Wilds is also open for humans, attracting more than 70,000 visitors last year. Between May through October, open-air buses regularly ferry guests from the visitor center to four protected vantage points where they can get out and observe the animals at their leisure. In addition to the predator center, stops include a wetlands walking trail, a lakeside trail and an outpost on the savannah. Of course, the journey between stops is also part of the fun. Reminiscent of African safari vans, the open-air coaches roll slowly along the gravel roads, stopping when animals are around so passengers can capture impressions and images, sometimes even reach out and touch the generally docile creatures. Other special tours, such as the weekly Saturday Night Sunset Safari and buffet dinner, include visits to the rhino husbandry center as well as the large barns where the preserve's more weather-sensitive species are over-wintered. A series of special nature outings and hikes are offered at other times of the year. There's even a 10K eco-thon each April. Situated picturesquely on a hilltop overlooking everything, the Wilds' main visitor center includes education facilities and an extensive gift shop, along with a full-service restaurant and snack bar. A wide verandah opens on to a broad, dry grass panorama that more resembles an African veldt than Ohio countryside. More active human visitors can enjoy more than 15 miles of challenging mountain biking trails on the grounds as well as a separate ATV center. The property also includes more than 100 lakes and ponds brimming with superb freshwater fishing, including trophy-worthy bass. Fishing access is for members only ($69 per year), but even though the angling here is tightly controlled, Fly Fisherman magazine has named the Wilds one of the country's top must-fish destinations. In addition to the animal sciences, the Wilds serves as a center for restoration ecology, as methods are developed not simply to regrade and reclaim the once ruined landscape and watershed, but to heal them so they can again support a full range of living organisms. Each summer, WildeCamp at the Wilds offers children and young teens a variety of programs that include overnights in a yurt village, swamp romps, night hikes and close-up encounters with the animals. Older teens interested in learning about becoming a wildlife veterinarian or naturalist can participate in hands-on camps. There are also more formal internships and teacher training programs. Currently, the Wilds overnight opportunities are limited to a primitive camping area and large yurts. There's also a new members' lodge that sleeps 12 with all the amenities and can be rented by the night or week. Even more ambitious accommodation options are in the planning stages, from a high-end tented safari camp to a full-scale eco-retreat and conference center. Other developments may more than double The Wilds' existing acreage. All in all, the Wilds of Ohio makes for an interesting and educational outing, one which reenforces the importance of preserving and conserving the world's wild animals and wild places. 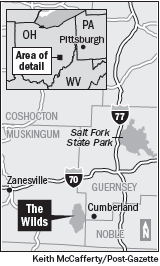 Directions: Take Interstate 70 west past Cambridge, Ohio, to State Road 83 south (exit 169) to Cumberland. Turn right on Ohio 146 and follow the signs to the Wilds. Hours: The Wilds is open seven days a week in June, July and August from 10 a.m. to 4 p.m. and weekends only in May, September and October. Regular tours take 2 1/2 hours, but because the buses depart every 10 to 20 minutes, visitors are free to get off and on as they wish and can linger at any of the stopping points. Entry fees: Safari passes cost $18 for adults; $17 seniors; $13 children 4-12; free for children 3 and under. Discounted rates are available for groups of 20 or more. For more information: 1-740-638-5030 or visit www.thewilds.org. Dr. Evan Blumer is executive director of the Wilds. Pittsburgh native Dr. Evan Blumer, executive director of the Wilds, has been instrumental in shaping the innovative facility since it opened to the public in 1994. Growing up in Stanton Heights, he visited the Pittsburgh Zoo frequently and credits it with helping to foster his interests in inhabitants of the world's wild kingdoms. 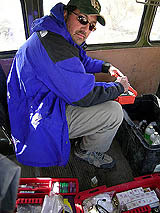 After graduating from Peabody High School in 1976, Dr. Blumer studied animal behavior at Bucknell University, did graduate work at the State University of New York at Stony Brook and eventually obtained a doctorate of Veterinary Medicine from the University of Pennsylvania, with a special interest in rare and endangered species. During a stint at Fossil Rim Wildlife Center, a 1,800-acre preserve in Glen Rose, Texas, he began working with rhinos, a fascination that he brought to the Wilds. He now serves on the board of the International Rhino Foundation. Always striving to bridge the gap between traditional zoos and animals in the wild, he strives to present wildlife populations in more natural settings, work that has taken him to five continents. "I am 100 percent about the long game," Dr. Blumer said during a recent telephone interview. "Everything we do at the Wilds is mission driven, first and foremost for the animals and their habitats. But rather than having the broad collection-oriented approach of a zoo, we focus on a limited number of rare species that match our expertise and resources and require special attention. "All the projects we have undertaken for our human visitors are intended to support that effort."